Earlier I’d promised some space to discuss logistics, so this spot right here looks good. I’ll provide a cursory overview of early modern logistics to start off the discussion. The old saying goes: “Amateurs talk tactics, professionals talk logistics.” I’m not a professional military man, but if the sources I’ve looked at are any indication, this saying certainly reflects the reality in the early modern period. This chart hints at one of the biggest problems with logistics if you’re trying to understand it: it’s a huge concept. Logistics, after all, ranges from the individual soldier munching on a crust of bread to vast economic networks encompassing thousands of laborers providing materiel to the troops. It includes the food, drink, clothing, shelter, weapons and munitions of the soldier and their beasts of burden, but it doesn’t stop there, since it radiates outward to transportation networks, magazine/warehousing systems, and procurement agencies. And of course it also includes the very land in which armies are campaigning, as well as the civilian populace (and their produce) wherever resources are being drawn from, to the fields, manufacturing workshops and natural resource extraction points of whatever countries you’re getting these supplies from. You should also include the fiscal and financial systems that allowed the purchase and delivery of said supplies, perhaps even the tax base and credit mechanisms by which wartime economies were sustained. It’s a product, a system, a process. It encompasses all levels of war, as well as a whole variety of historical subfields. In addition to the history of armies, you also need to know something about the history of governmental bureaucracies and private business networks, of nutrition, of agriculture, of transportation, of economics and finances… So it’s probably not a surprise that lumping all the various aspects of supply under one rubric of “logistics” is a recent invention, even if generals and military planners have been dealing with it for millennia. Circa 1700 the term “logistics” was used almost solely in a mathematical sense: “the method of calculation by sexagesimal fractions; the fundamental rules of algebra.” But by the late 18C it was being used in the military sense we are familiar with, e.g. Smollet’s The Critical Review or the Annals of Literature (1779) pithily summarized it as “the art of calculating times, powers, distances, and wants.” (FWIW, a 1760 dictionary entry for “logistics” only includes the algebraic definition.) Total speculation on my part, but it seems like the calculations used to figure out how many men needed to make a formation of X ranks and Y files and other such applications of mathematics to military men in space led people to apply the mathematical term of ‘logistics’ to military affairs more broadly, and it expanded from there. 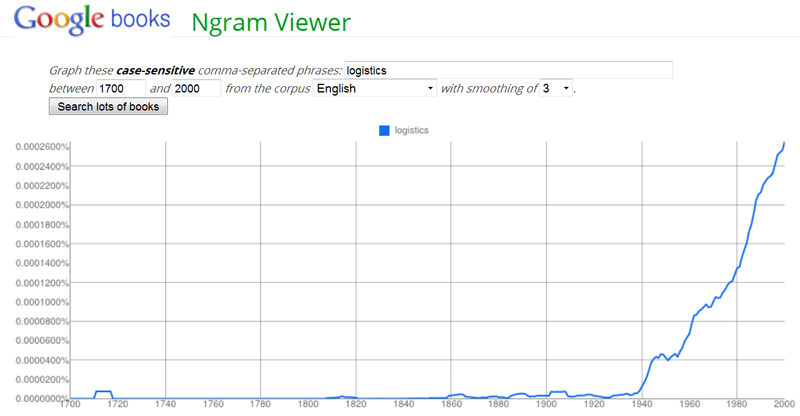 It’s also probably not a coincidence that the modern term “logistics” was born during the late Enlightenment, when many were seeking to apply math and science to war, especially when combined with the 18C’s more refined appreciation of the operational level of war (in contrast to the much-earlier tactical application of geometry to fortifications and battlefield formations). Supply is a boring everyday event, and usually went un-noted by most contemporaries unless there was a major problem, e.g. they were running out of food or ammo. Even then, most military memoirs and letters would hardly ever be able to give any kind of quantified description beyond “We’re hungry” or “No bread for three days.” Nice to know, but not that informative about how significant of a breakdown this was, or where exactly in the supply chain it occurred. Supply is consumed, so it doesn’t leave behind many artifacts like fortifications or battlefields or weapons (although this last could be included under logistics). You’ve possibly got the ovens, etc., but it’s hard to figure out how much those could theoretically produce, must less how much they actually produced for a given campaign. Supply is about large quantities, the number of men being fed or the number of loaves of bread delivered. As we’ve discussed before, it’s really difficult to get good measures of army sizes in the early modern period. This is why you’ll see lots of hypothetical calculations in the secondary literature: “Each soldier was allotted a 3-pound loaf of bread every two days, so therefore for an army of 50,000 men this would require X tons of grain…” As in other areas, many historians rely on a few prescriptive manuals for basic rules of thumb: in my period, Nodot and d’Aulnay are the two well-known French manuals, and everybody still uses Perjés despite his calculations relating to the Hungarian theater particularly. Plus, this may not even include all the camp followers (women, kids…) that often tagged along with an army. Recall also that by the late 17C armies in the Low Countries and other urbanized areas (50,000-100,000 men) were literally the size of large cities, e.g. the Spanish capital city of Brussels. Feeding and moving the equivalent of a town every few days presented a huge strain on early modern systems. Supply is also about money, and there too we have lots of gaps in the sources, not to mention all the problems with conversions between various currencies that make it difficult to make valid comparisons from one country or theater to another. In various archives you can find all sorts of scraps of paper with figures on them, but most of those documents are decontextualized, or provide only a specific snapshot in time. We historians are fortunate when we can find summaries compiled by contemporaries, but often these are either theoretical (e.g. budgeted), or only written up when someone is trying to make a point – try to get more money from the government, blame an ally for failing to contribute their fair share, defend yourself from accusations of corruption, and so on. A lot of the sources are fragmentary and intermittent. Documents on the civilian administration of the logistical systems are often in different archives, or at least not in the operational correspondence and memoirs that many military historians rely upon. And they aren’t always obvious to interpret without understanding how the system works. What have historians learned about the EME logistical system from such sources? I’ll make a few impressionistic thoughts based on my recollection of what I’ve read in the past – I don’t have time now to do a thorough review of the literature. First, there are a wide variety of supplies needed by an EM army. All of these consumables required a surprisingly complicated system of production and distribution, a whole supply network that many moderns who buy their food in plastic containers from the grocery store don’t appreciate. Bread has received by far the most attention: man may not live by bread alone, yet you’d never know when looking at the literature. Bread was a staple of early modern European life (God’s supposed to give us our daily ration after all), and that starchy product required sowing and harvesting grain, threshing and milling it into flour, then baking it into loaves or biscuit, then transferring it to the regiments, then preparing it around the campfire with whatever other foods (stew) for consumption. On occasion small armies might make their own, getting by using hand mills and portable ovens, but in the more populated theaters (just where the most intense and frequent campaigning occurred), it was easier to rely on the existing infrastructure. Which usually meant magazines (grain warehouses, mills and ovens) established in fortified towns, with convoys of wagons (or boats) bringing the bread to the troops. As the armies got larger, they increasingly had to ship in grain from elsewhere – under William III, for example, the Maritime Allies relied heavily on the Baltic grain trade to feed their cities as well as their armies. The question of where an army gets its bread from has also led to a wide-ranging discussion of the extent to which an army was tethered to magazine supply lines or could otherwise “live off the land” (van Creveld and Lynn sparred on this, for example) – a soldier can’t just pick up a stalk of grain and start chewing on it, unless he’s a hayseed. Historians have also spent all sorts of time estimating how many days’ march you could travel from your magazine base, although more rare are actual measurements coming from real operational situations. This question has some relevance to explaining the differences between early modern and revolutionary/Napoleonic warfare. Yet for all the talk of bread, I can’t remember seeing anything on liquid refreshment for the troops, other than when troops discover a cellar full of booze and go on a bender. Water quality was pretty iffy back then (though possibly they were used to it) and non-aqueducted cities had major water-carrying trades. Horses must have drunk from whatever nearby water sources they could locate, but I wonder about whether the troops were doing the same – I can only imagine what thousands of soldiers and horses did to (and in) the rivers and ponds along their march routes. I’ve read that most Europeans tended to drink beer or wine, and I would think that most bottled or casked beverages would’ve had to have been sent to the army rather than procured locally. You’d think that would require a fair amount of transport – a gallon of water weighs over 8 pounds and people need at least one gallon per day – but I haven’t looked at logistical contracts on this topic. The second-most studied logistical requirement was feeding the horses. Even an infantry-heavy army would still use thousands of hungry horses to move the officers, baggage and artillery (not to mention bread convoys). Bread processing might be centralized in certain magazines and the sacks of grain/flour transported there from all over for baking, but given the massive volumes of freshly-cut grass (relative to how much a horse needs to eat – 40 pounds a day? ), combined with the fact that horses couldn’t get enough nutrition from a year-round diet of dry fodder, meant that you had to acquire much of your horses’ food locally. Getting fodder for your horses thus required sending out forage parties, which required knowledge of horse care (horse sense?) and knowing what to feed a horse, as well as an ability to estimate how many horses any given field will feed (a point Erik Lund makes). The largest of these forage parties might number several thousand troops with their own guards, and could easily lead to skirmishes. Historians have also noticed the link between fodder and operations. For example: the need for locally-gathered fodder made it possible for an enemy to consume all the fodder in an area, which in turn would eliminate further operations there. This was often given as a reason for the seemingly-random movements of German armies in the 30YW. A more discrete case comes from 1710, where the French prevented the Allies from besieging their desired target of Arras by consuming all the fodder in the area. Munitions and weapons were required in far small numbers, and also required delivery from rear magazines (unless one confiscated a village’s church bells to melt down into musketballs). Olaf van Nimwegen has pointed out how few rounds of ammunition and ounces of gunpowder Dutch armies in the Spanish Succession went through during many campaigns – sieges were the major consumer of powder and shot, but most armies could manage to fight a field battle with the ammo they had been given at the beginning of the campaign. The supply of saltpeter and the construction of powder mills was important on a grand strategic level, but for most early modern operations munitions were rarely the limiting factor. The financial side of logistics is probably the most complicated of all, given the labyrinthine nature of early modern finance. By at least the 16C European armies began using bills of exchange for payment in-theater, e.g. promissory notes drawn up in your capital city to be cashed by a business contact in the theater of operations and debited from that creditors’ account – governments relied on the international business connections of private bankers and financiers for this function. This was preferred to the more risky transport of massive amounts of precious metal coinage to purchase supplies abroad. Governments also tried to minimize the specie paid to their troops by taking deductions out of the soldiers’ pay for various items, often including clothing and bread. It’s in such documents that you’ll find terminology that only a bureaucrat could love, terms like “poundage” and “offreckonings.” The amounts disbursed for supply could be quite large, which led to inevitable complaints about spending our money in their countries, not surprising in an age where many viewed trade as a zero-sum game. The English were particularly conflicted about this during Louis XIV’s later wars: happy that their own lands weren’t being despoiled by war, yet angry that English gold was being spent by Dutch middlemen to purchase Flemish (or Baltic) food to feed English troops in Flanders. Bread, beer, cheese-wheels, hay and cash. So what? Why is logistics important? In addition to the antiquarian interest in understanding how the soldiers lived, the main question most military historians seek to answer through logistics is what effect these supply issues had on EME operations. If necessary, we could invoke Napoleon’s famous stomach-marching army. But the historian’s interest in logistics stretches beyond operations as well. Long before serious academic study was dedicated to the topic, local historians were concerned with detailing the impact of war on their particular communities – contributions and plunder was a large part of this question. By the 1970s we started to get a consensus among academic military historians that logistics constrained EME army movements, and this reliance on magazine systems is often used to explain why so few early modern operations were decisive (Perjés’ ‘crisis of strategy’). Many historians have moved beyond the operational level of logistics within the past few decades, to look at the economic, financial and agricultural/industrial underpinnings of early modern war. This includes historians of military administration exploring how many of these supplies were provided (and paid for) by the government, versus the amount paid for by the regimental officers and generals, versus the amount requisitioned from locals – though we still lack solid numbers for most wars. At its broadest, this question of paying for war leads to a discussion of state formation: how war drove the development of the modern state and how state bureaucracies facilitated the waging of war. Logistics is a huge topic, even when looking at one country’s efforts in one specific war. You need to know the consumption of the army, but you increasingly need to know both the mechanics and the macro-view. We need to consider which supplies were purchased by whom, provided by who to whom, how, where and when. Like the rest of EMEMH, the study of logistics has expanded significantly since the 1960s, adding more questions even as we struggle to answer the original ones. Various contemporary acts and ordinances about supply, sometimes even published, e.g. England and Wales. An act for the more certain and constant supply of the soldiery with pay; and the preventing of any further oppression or damage to the people by free-quarter or billet Die Sabbathi, 12 Maii, 1649. Ordered by the Commons assembled in Parliament, that this act be forthwith printed and published. Hen: Scobell, Cleric. Parliament. London: printed for Edward Husband printer to the Honorable House of Commons and are to be sold at his shop, 1649. Nodot, François. Le munitionnaire des armées de France, qui enseigne à fournir les vivres aux troupes avec toute l’oeconomie possible….. Paris: chez Cusson & Wit, 1697.
d’Aulnay, Dupré. Traité générale des subsistances militaires, qui comprend la fourniture du pain de munition, des fourages et de la viande aux armées et aux troupes de garnisons, ensemble celle des hôpitaux et des équipages des vivres et de l’artillerie, par marché ou résultat du conseil, à for-fait, ou par régie. Paris: De l’Imprimerie de Prault père, 1744. Chenevières, François de. Détails militaires dont la connoissance est nécessaires à tous les officiers, & principalement aux commissaires des Guerres. Paris: Chez Charl. Ant. Jombert, Libraire du roi, pour l’artillerie & le génie, 1750. Dublanchy, C-N. Une intendance d’armée au XVIIIe siècle. Etudes sur les services administratifs à l’armée de Soubise pendant la Guerre de Sept Ans, d’après la correspondance et les papiers inédit de l’intendant François-Marie Gayot. Paris: 1908. Fortescue, Sir John W. The Royal Army Service Corps: a history of transport and supply in the British Army. London: Cambridge University Press, 1930. Redlich, Fritz. De Praeda Militare: Looting and Booty 1500-1800. 1956. Also his German Military Entrepriser. Davies, C.S.L., “Provisions for Armies, 1509-1560,” Economic History Review 17 (1964-1965): 234-48. Ferguson, Ronald. Blood and Fire: Contribution Policy of the French Armies in Germany (1688-1715). Ph.D., University of Minnesota, 1970. Perjés, Géza, “Army Provisioning, Logistics and Strategy in the Second Half of the 17th Century,” Acta Historica Academiae Scientiarum Hungaricae, 16 (1970): 7-51. Milot, Jean, “Un problème opérationnel du XVIIe siècle illustré par un casualties régional,” Revue du Nord 53 (1971): 269-285. Waddell, Louis. The Administration of the English Army in Flanders and Brabant from 1689 to 1697. Ph.D., University of North Carolina, 1971. Baker, Norman. Government and contractors: the British Treasury and war supplies, 1775-1783. London: Athlone Press, 1971. Parker, Geoffrey. The Army of Flanders and the Spanish Road, 1567-1659. Cambridge: Cambridge University Press, 1972.
van Creveld, Martin. Supplying War: Logistics from Wallenstein to Patton. New York: Cambridge University Press, 1977. Sturgill, Claude, “Changing Garrisons: The French System of Etapes,” Canadian Journal of History 20 (1985). West, Jenny. Gunpowder, Government and War in the mid-18th Century. Royal Historical Society, 1991. Wheeler, James Scott, “Logistics and Supply in Cromwell’s Conquest of Ireland,” in M.C. Fissell, ed., War and Government in Britain, 1598-1650 (Manchester, 1991). Wheeler has written several articles on British logistics during the middle of the 17C, including his The Making of a World Power. John Lynn, ed., Feeding Mars: Logistics in Western Warfare from the Middle Ages to the Present. Boulder, CO, 1993. This includes a large number of chapters, including Luttwak’s “Aristocratic” mentioned above. van Nimwegen, Olaf. De subsitentie van het leger: Logistiek en strategie van het Geallieerde en met name het Staatse leger tijdens de Spaanse Successieoorlog in de Nederlanden en het Heilige Roomse Rijk (1701-1712). Amsterdam: De Bataafsche Leeuw, 1995. Lund, Erik. War for the Every Day: Generals, Knowledge and Warfare in Early Modern Europe, 1680-1740. Westport, CT: Greenwood Press, 1999. Edwards, Peter. Dealing in Death: The Arms Trade and the British Civil Wars, 1638-1652. Sutton Publishing, 2000. Parrott, David. Richelieu’s Army: War, Government and Society in France, 1624-1642. Cambridge: Cambridge University Press, 2001. Rowlands, Guy. The Dynastic State and the Army under Louis XIV: Royal Service and Private Interest 1661-1701. Cambridge: Cambridge University Press, 2002. Stapleton, John M. Forging a Coalition Army William III, the Grand Alliance, and the Confederate Army in the Spanish Netherlands, 1688-1697. Ph.D. dissertation, Ohio State University, 2003. Cénat, Jean-Philippe, “De la guerre de siège à la guerre de mouvement: une révolution logistique à l’époque de la Révolution et de l’Empire?” Annales Historiques de la Révolution Française 348 (2007): 101-115. Robinson, Gavin, “Horse Supply and the Development of the New Model Army, 1642-1646,” War in History 15 (2008): 121-140. Bannerman, Gordon E. Merchants and the Military in Eighteenth-Century Britain: British Army Contracts and Domestic Supply, 1739-1763. London: Pickering & Chatto Publishers, 2010. Rowlands, Guy, “Moving Mars: The Logistical Geography of Louis XIV’S France,” French History 25 (2011): 492-514. There are also lots of case studies from the 19C-20C, often with a local history focus or else in specialized military journals. As you can see from the above list, by the 1970s logistics was clearly in the air. By the 2000s however, financial and fiscal aspects seem to have become more dominant, although I didn’t include many of those cites. As usual, my focus is on 17C-18C western Europe (England, France, Netherlands especially), so that’s what I know enough to talk about. Over the next week or two I’ll try to see if I can get these titles in a group Zotero library. There’s a nice collection of sayings on logistics here collected by, no surprise, a naval supply group. Very welcome post. I think even in our everyday, modern day, life ‘logistics’ is a bit neglected or undervalued. Whenever we buy a new iPod/Pad/Phone/Mac, go on a big holiday including skydiving, shark cuddling, etc, it is mentioned in all of our online diaries (Facebook, Twitter, etc). But the daily recurring procedure of buying bread, getting the food cooked, is deemed less important. Only when of enough importance to be shared on Facebook. The funny thing is that Dutch highways are usually congested by trucks taking care off all those daily neccessities, and probably much else by trucks carrying precious gadgets. Probably there is some analogy to military history, with much emphasis on the battles and sieges, and less on logistics. When I had still access to all journals I found a paper on the logistics during the siege of the Ile de Rhe by the English in 1627. It was illustrative as a case study , for me at least, that even such a minor operation meant so much trouble for the planners. Resulting in insufficient supplies allocated in advance, or when there was enough too few ships to transport the supplies to the island. The result being that the troops on the island were almost starving. I am sorry I don’t have the title at hand right now. Just over the past few years in the US there is a lot more recognition of the food process in particular, at least for that subset of Americans who watch the plethora of cooking contest shows on cable TV now, and the Food Channel more generally. And controversies like working conditions at Foxconn do their part to remind American consumers that iPads aren’t just picked fresh from the vine. But generally most people (myself included) have little idea of how most of the products we consume are manufactured and delivered to our doors. Ile-de-Ré was indeed a right mess. The antipathy towards staff work in general and logistics in particular is understandable when coming from an uninformed blowhard such as our English pamphleteer who seemed to believe that the ancients fought without food or fodder, but much less so when coming from those who ought to be aware of their importance. Even Napoleon, in spite of (or because of) his reliance on Berthier’s talents, treated him shamefully. Reading Bonaparte’s insults, it’s hard to reconcile that they’re directed toward the same man who stormed the bridge at Lodi and who was wounded at Marengo. I wonder if this ill feeling may stem from the fact that the staff officer is often in a position to thwart, however reluctantly, the master plan of the commander. When the general’s freedom to execute some bold stroke is prevented due to food, forage, ammunition, or even the capacity of the road network, I suspect there’s an element of resentment. Good point. That probably is also a part of the reason why the engineers were so despised. As you suggest with the Napoleon example, it wasn’t just “amateurs” that felt this way. That English pamphleteer may have been a blowhard, but his sentiments were reflected in much of the correspondence written by Marlborough and other English officers. Considering the vastness of the scope of this topic, I think this is a good place where to start, and from where we can branch out a productive discussion on logistics, especially since it is particularly relevant in relation to the problem of efficiency vs. vigour. After all, were not the Napoleonic Wars the arena in which so many of the wet dreams of vigorous officers and theorists came true? And are they not also the wars that have best served as a beacon and model to all vigorous theories of war ever since? Of course, it is easy to exaggerate the vigour-dominance of the Napoleonic period, after all, there were commanders who achieved notable successes during this period while submitting to a more prudent, ‘orthodox’, mindset, like Wellington or even Archduke Charles. But I disgress. The question that really compels me is the following one: how much more different were logistics in, say, 1806, than they were in, say, 1525? An ancillary but equally tempting question would be: to what extent were such changes, if there were any, favorable to the implementation of new, more vigorous, strategic and operational doctrines? In short, did the nature of logistics during the period 1500-1792 really render vigorous strategic and operational doctrine into an universally less-preferrable option? For that we need to know the actual nature of logistics during all this period. As Dr. Ostwald pointed out, such an endeavor would necessarily entail delving into non-military topics such as political, economic, bureaucratic, financial, demographic, and even geographic history, to name just a few of the fields we would have to touch on to get even a vague idea of how ‘logistics’ worked, let alone figure out its’ place in the conception and execution of strategic or operational designs. I believe Napoleon could afford to rely so much in forced marches and deep penetrations of enemy territory because the great population density, agricultural productivity, and road quality in Central Europe allowed him to live off the land to a large extent. In Russia, where roads were underdeveloped, there was less population density, and greater distances to cover, he found his typical methods less effecitve. However, I must admit that I am no expert in Napoleonic warfare, let alone Napoleonic logistics: to what extent did Napoleon rely on fixed magazines and staging posts behind his line or march? I recall him using such etapes during his invasion of Russia. To what extent did he live off the land and in which campaigns he did so the most? Anyone with a better understanding of this period is invited to step in. The point that I try to emphasize is that the conditions of a theater itself are part of ‘logistics’ just as much as the bureaucratic machinery that feeds an army, if we wish to understand the difference of logistics during the Napoleonic period and logistics 300 years earlier, we must consider differences in theaters within those particular periods as much as the differences between the periods themselves. As for the books, professor, thanks a lot for the recommendations, I see that I will have some hunting to do in the future. A comparative history of military logistics from 1500 to 1800 has yet to be written, and I think we’re only starting to get a sense of its contours, much less its details. The French article by Cénat is one of the few to (recently) address the topic on a broad timeframe. Things are indeed complicated immensely by the variations from theater to theater: distance from home country to theater (and how accessible the theater was, e.g. free sea access, or requiring the Spanish Road? ), land area, topography, climate (that armies often took a ‘summer quarters’ break during Iberia’s July/August heat is noteworthy), agricultural productivity and population density, waterways and road networks, financial networks (in some theaters it was hard to find people to cash bills of exchange)… Several of these latter factors were changing/improving over the course of the 18C, which is a big part of the answer. Rowlands’ recent work on “Moving Mars” is also an important corrective to the common assumption that all central positions/interior lines of communication are equal. The civilian population was larger/more urbanized in Flanders (ditto their agricultural infrastructure). Northern soldiers and horses had serious problems acclimating themselves to the Mediterranean climate and food, yet the Portuguese allies weren’t particularly reliable as replacements. The Flanders armies were 2x-4x larger while fighting in an area the size of only Catalonia, whereas campaigning in Iberia ranged from Portugal to Gibraltar to Valencia to Catalonia (~10x as large an area as Belgium); twice armies covered its entire breadth in a single year. There was a far higher density of fortifications in the Low Countries, even though the Duke of Berwick noted that the poorly-fortified towns in Spain were harder to capture than those in Flanders because of the logistical problems Spanish armies faced (smaller armies, fewer cannon and munitions…) – Vauban also noted that the Low Countries theater was unique for the excellent waterways that allowed huge numbers of cannon to be easily transported to siege sites. In a sense, warfare was “easier” in the Low Countries only if you were wealthy enough to be able to afford it. I’ve speculated before that there must have been invisible technological/economic changes underpinning Napoleonic warfare. The one that I like to throw out is the Napoleonic greatcoat. That’s a garment that the armies of the War of the Spanish Succession simply couldn’t afford to issue to their soldiers, as even the lighter jackets that were issued were clearly a significant financial burden. Then, sometime in the last quarter of the eighteenth century, the heavy woolen mid-calf great coat just appears and becomes indispensable. How indispensable? In General Rowan-Robinson’s 1933 book on the mechanisation of the British army, it even becomes an argument for trucks. In the recent exercises, he points out, the men have become so burdened with light machine guns and ammunition that they can’t carry their greatcoats. How can infantry survive without their greatcoats? Now, I’ll be the first to admit that that pulls in much later evidence, but it still seems telling. What you can do with infantry in terms of march stages and all-weather capability is heavily dependent on their ability to be out in the open. A snugly warm greatcoat makes it possible for men to march longer, sleep rougher, and get by without less firewood. So when did this putative transformation happen? How are we going to measure its precise effects? And that’s just one everyday technology of war. What about better wagon wheels? Better pioneer tools? Better boots? There’s a huge field to be investigated here. These elements seem to me like a fair starting point for any discussion on the differences between Napoleonic warfare and the period that preceded it, though other factors such as technological developments should definetely be considered as well, along with political ones such as the widening of the European diplomatic-political sphere to include Russia and Prussia as major players, which, I believe, ultimately is the reason why Flanders and its’ surroundings eventually stopped being ‘the cockpit of Europe’ and Central Europe eventually gained greater prominence as a theater (though, of course, a similar situation had already been seen during the TYW, especially after the rise of Sweden). This development, of course, also affected the sheer geographical range within which warfare took place. I’d agree, particularly in regards to the development of professional military staffs and professional civilian bureaucracies. The Prussian army of 1806 versus that of 1812 is a testament to the value of both institutions. It was indeed off-hand, in large part because I don’t know of anyone who has looked at the matter in any detail. Van Creveld’s Supplying War probably comes closest, but of course there are lots of problems with his early modern coverage, since so little basic research has been done on the topic. Exact area of operations (areas, distances and speeds marched). GIS would be useful here. Campaign season length and operational tempo, obviously related to events like battles and sieges. Transportation network (roads and rivers). Fortifications (density) relative to transport networks, including fortified lines. Ideally we’d have population density and agricultural productivity as well. I’ve collected data for some of this for the Spanish Succession, and John Stapleton and I are hoping to co-write a book looking at the operational details of Louis XIV’s later wars. I think a comparison of these stats across time would at the least give us an idea of how much things changed, and where we would need to look for explanations. But until we do this, historians will be content, as I was, to just provide a laundry list without much further investigation. Regarding the Low Countries losing its cockpit status, we should also mention the decline of the Netherlands as a major power, although Austria’s acquisition of the southern Netherlands somewhat offset this. Regarding geographical range, the atlas for the old New Cambridge Modern History has some useful maps that show areas of campaigning during the wars of Louis XIV’s reign. It’s also interesting to look at how Louis XIV’s wars expanded from a single theater in the the War of Devolution to the massive four-front War of the Spanish Succession. I think a more detailed look at the European states’ abilities to conduct multi-front wars across the early modern period would be interesting, and serve as evidence of the rising ‘fiscal-military’ state. Interesting on the great coat. Perhaps unrelated, but D.W. Jones argues that English woolens were a major beneficiary of the Spanish Succession and Great Northern War, since their competitors’ lands were being campaigned in, and of course 100,000s of soldiers (including Russian) needed uniforms. I just came across a newspaper account (I think Defoe’s Review from 1705) talking about how the English heavy-duty woolens were better than the lightweight fabrics made on the Continent. A connection? I haven’t really looked at uniforms enough to tell. Are paintings from the 18C accurate enough to identify changes in uniforms like that? Perhaps the many images in the Anne S.K. Brown art collection (online) might be of assistance. Certainly the key documents would be requisitions or orders from the manufacturers themselves, but that’s way out of my league at this point. Fascinating discussion. As a layman I would, naively, say that logistics is ‘getting some commidity X from location A to location B’, but that is only partially true obviously. As Jamel put forward in the introductory post, money plays an important role in ‘getting X from A to B’. With the institution of the Bank of England in 1694, I was wondering how this changed (improved, optimized) the way the British could wage wars and supply and maintain armies overseas. Can this be verified quantitatively? Or to put the question in a broader perspective, how did innovations in the financial world (stocks, derivatives, long-term loans) influence and help states to finance their wars. I just wrote 6 pages on that for my ‘English success in the Spanish Succession’ chapter. I won’t repeat myself too much, but we have decent estimates of some of the costs of the war (from Hattendorf, England during the WSS; Dickson, Financial Revolution in England; Dickinson, “Sword of Gold”). These numbers don’t always match if we look too closely, but I’m combining a bunch of different types of figures together since it’s what we’ve got. Say the Spanish Succession cost the English/British government £55-£62 million pounds (wartime budgets ranged from £3.3-£12.6 million per year). Their income lagged expenditures by £29 million, so they needed to borrow that amount. A fair amount of it they could get from corporations like the Bank of England: at least £6.5 million from the BoE, another £1.2 million from the (two) East Indies Companies, and then Robert Harley created the South Sea Company (which later ‘popped’ in the South Sea bubble) to raise £9 million and refinance some of the older debt in 1711. When desperate they could issue lotteries – newspapers would even publish their terms to encourage subscriptions. Britain ended up with a national debt of perhaps £40 million but were able to convert a lot of it into South Sea stock. Fundamentally it’s about faith in the government’s ability to pay, and kicking the can down the road. You also have the issue of bills of exchange, e.g. the English forced the Dutch to cut off their postal communication with France in 1703 because the French were using Amsterdam-drawn bills to buy supplies for French troops in other theaters, e.g. Italy. D.W. Jones, War and Economy in the Age of William and Marlborough details the English side in great detail. He emphasizes the problem with England’s balance of trade – sending out English gold to purchase foreign supplies for English troops across the Channel. At the same time, you have a political argument between the Tory landed interest (being taxed 4 shillings to the pound through the Land Tax) and the new ‘monied men’ (aka stock jobbers) based largely in London (the City) and profiting from the war’s financing. John Stapleton has written about financing of the 9YW. Gary McCollim has a book coming out this year on Desmaretz’ efforts at the end of the WSS to rescue Louis XIV’s finances, based off his Ph.D. from Ohio State, and Daniel Dessert has a book on France’s financiers more generally (Argent et pouvoir). Aalbers “Holland’s Financial Problems” is a bit older, but talks about how crushing the Dutch debt was after fighting L14 for 40 years. I am personally quite curious as to the extent to which the financial burden of continuing the war against Louis was a factor in the English withdrawal from the war. After all, the whole crux of Louis XIV’s strategy by the end of the war seems to have been to wear down the cohesiveness and impetus of the Allies by retreating into fortified lines within the pré-carré. This would bog his enemies down on expensive sieges and protracted campaigning and exhaust either their political will to persist, their financial means to do so, or both. If this was his intention, at least he seems to have been successful. Perhaps had it not been for the pré-carré and the strategy of lines, and barring a vigorous ‘decisive battle’ defeating any invasion, northern France would have been overrun. That will be part of the book I’m working on. It’s hard to know what motivated the English voting public, but taxes, politics and religion were all important, and all were connected to each other. “The difference that exists between the present situation of the King’s affairs and that of [the Dutch War] is that in those previous times, the fortune of His Majesty and of his kingdom was in the hands of men who, by being killed or by making a bad decision, could lose it in a moment, or at least compromise it in some way by the loss of a battle [from] which it had been difficult to reestablish. Whereas, presently, because of the great conquests that have been made, and because of the advantageous situation of the places that have been fortified, the King finds himself able to grant command of his armies to whomever it pleases him, without having anything to fear from the mediocre capacity of those to whom he confides it.” Vauban also wrote a famous letter arguing for the need for a frontière de fer. Most (non-Marlborough) historians acknowledge that Vauban’s pré carré stopped the Allies from capturing Paris. What I find interesting is 1) how difficult it is for Marlborough biographers to accept this, as evidenced by their constant reliance on counterfactuals, and 2) how clearly contemporary Englishmen knew this and wanted to avoid it, yet couldn’t. Army sizes at least, is a topic that has received a lot of attention, particularly in the ‘Military Revolution’ literature, where debates regarding this matter still rage on. I remember a paper from Simon Adams in which he makes some rather interesting points. He pointed out the importance of defining what exactly was meant when defining “army” whenever one spoke of ‘army growth’, which means drawing the distinction between the field armies(massed and mobile concentrations of troops that engaged in battle, maneuver, etc), and a state’s overall military establishment(which could include static and dispersed troops in garrisons). This is particularly pertinent in any talk of logistics since the maintaining of a relatively small force in a fixed place from which it can sustain itself through contributions(a garrison), and the supplying on an normally larger force on the move clearly represent very different logistical situations. Formulated in another way, talking about a state’s logistical system can just as easily denote the capacity of such a state to sustain a number of troops in a completely static manner within its’ borders as it can denote its’ ability to consistently supply large concentrations of troops on the move inside enemy territory. Adams also contests the commonly-held notion that armies increased heavily between 1500 and 1660. Within the context of field armies at least, he argues that the peak size of armies involved in campaigning and battle during the TYW was not dramaticlly higher than that of the Italian Wars. IIRC David Parrott and John A. Lynn also sparred with this idea quite a bit. In particular, Parrott’s Richelieu’s Army argues that it was bureaucratic and financial reform from above that eventually allowed Louis XIV to really field larger armies than had been the norm thus far. Indeed, the reign of Louis XIV saw European armies field and supply larger armies in Western European soil than had been possible ever since perhaps the fall of the Roman Empire. Though I’m still at a loss as to how exactly did the ca. 80,000 total men involved at Turckheim turn into the ca. 150,000 involved at Malplaquet.Also, how did the Allies manage to develop the means to sustain field armies as large as those of Louis at more or less the same time? Did they do so in response to the larger armies fielded by Louis, or was it a parallel process? The structural difference between the logistical and bureaucratic-political mechanics of the Dutch Republic and its’ allies in comparison to that of the absolute monarchy of Louis XIV renders this question particularly interesting. Then there’s also the wider question of how did the numbers that could be supplied in a battle or campaign during the year 1700 skyrocket to the ca. 600,000 men that participated in the Battle of Leipzig, during the Napoleonic Period. I don’t know who the first modern historian to emphasize the different ways of measuring army sizes was, but I know John Lynn wrote on French army growth back in 1980, and I’m pretty sure Parker’s Army of Flanders and the Spanish Road talked about it as well. In general, Lynn’s written far more about logistics and army sizes than any other EMEMHian (other than James Scott Wheeler perhaps). Elsewhere I cited Lynn’s recent revision to French army growth (“Revisiting the Great Fact of War and Bourbon Absolutism: The Growth of the French Army during the Grand Siècle”). John Stapleton’s dissertation (soon to be book) will include British and Dutch army sizes by year for the latter half of the 17C. In the WSS, the Dutch ramped their army up rather quickly from 45,000 peacetime (forgot the exact figure) to 137,000; it took the English awhile longer (from 25,000 on the English, Irish and Scottish establishments), although in 1711 they were claiming to be supporting (in some fashion or another since it includes subsidy troops) 240,000 soldiers and sailors. Much of this was possible because there were a few hundred thousand German mercenaries that just about everybody hired (97,000 in Anglo-Dutch service by 1711). This is where the English and Dutch got most of their two troop augmentations in 1703 and 1709 from. Peter Wilson’s German Armies discusses this in great detail. My impression is that the Allies increased army sizes in 1703 & 1709 after committing themselves to the Iberian theater with the 1703 Methuen treaty, and after they felt a shortage of men had hindered their previous operations. But I don’t have a good handle on that yet. Feeding all these men seems to have been thanks to the importation of massive amounts of Baltic rye via the Netherlands (Olaf van Nimwegen talks about this in his De subsitentie van het leger). During the French famine of 1709-10, the Flanders army probably increased in size because Marshal Villars was confiscating the civilians’ grain to feed his army. 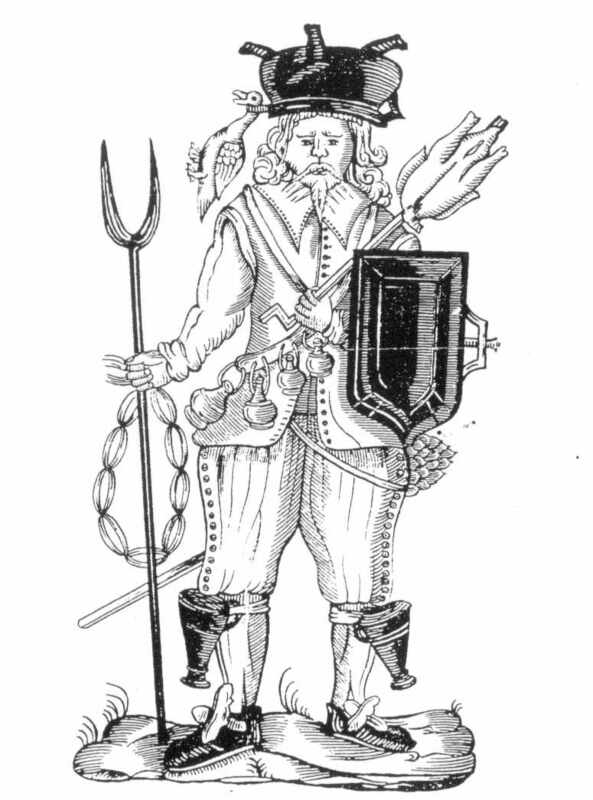 Plus, late in the war L14 was drafting militia directly into regular army units (Girard, Le Service militaire en France à la fin du règne de Louis XIV: racolage et milice). Quantity doesn’t always equal quality. As we mentioned elsewhere, these huge numbers were only possible in the heavily urbanized regions of Europe: the Low Countries especially, but also northern Italy and along the Rhine – I’ll bet decent water transportation was a key variable. The armies in Spain were one half or a third of the size of what we see at the end of the WSS in Flanders. It’s no surprise that after the WSS there are military theorists (de Saxe? Puységur? Guibert? don’t remember off hand) who argue that field army sizes should only be 40-50,000 men for the optimal combination of strength and mobility. Frederick the Great’s armies weren’t nearly as large as what both sides had at Malplaquet, so perhaps we need to look even later in the 18C – or maybe compare theater by theater. As for how army sizes can balloon so much by 1812, I’d assume the general population increase also meant larger agricultural infrastructures that could support more men. (I’m skeptical canning made a difference, but it’s always fun to tell the students that they owe the metric system and canned food to the French Revolution). Someone should collect a bibliography for logistics across the 18C. Maybe when I get the Zotero library set up. Note that the aggregate size of the German armies fielded by the Holy Roman Empire in all its federalist administrative glory rose in line with that of absolutist France. Anyone interested in the subject can follow up on administrative histories of the military effort of the Swabian and Franconian Circles by Neipperg and Sicken. I’m sure that there’s somewhere to go for the military-administrative history of the Diet. For the Imperial war effort I just used Feldzuege des Prinzen Eugens. You just let your eyes glide over the viciously antisemtic handling of the Emperor’s “court Jew,” Samuel Oppenheim. I’m sure that there’s been a lot since, though. With this literature, I think we’re safely in the realm of investigating special problems rather than trying to understand the basic outlines of war finance. What I’m saying, then, is that the rising size of WSS armies is a puzzle that stands apart from the administrative history. Against the cockpit theory, I’ll point to the much smaller size of armies fighting in the Po Valley, in spite of good water communications and high population densities. Again, the armies that fought in Pannonia were quite large, even if reported Turkish strengths are Orientalist fantasy. Not to sound obsessive on the subject, I’m going to come down on my old argument that the agronomic geography of fodder is also the geography of strategy. Though this would also have to be an argument about access to fodder and opportunities to forage if my theory is going to account for the Po valley exception. Finally, then, an alternative explanation for the escalating size of the armies of the WSS: it’s precisely a function of the number of theaters in which there was fighting. The armies were supported by contributions and letters of credit rather than by ready money, and local economies were still sufficiently independent that these resources could only be tapped within the provinces concerned. If I’m right, this is another argument for local histories of war finance. As I was writing my comment, I did wonder about why northern Italy didn’t have larger armies. The Austrians never managed to field large armies there and had huge logistical problems (hence little need for escalating army sizes), but that just begs the question of why. Right now I’m putting together a rudimentary map of the various army sizes in the various European theaters for the Spanish Succession; we Anglos do tend to forget about the Hungarian theater as we sacrifice our offerings to the Great Duke of Marlborough. Or else we just nod our heads when reading English complaints of the Austrian “distraction” with that little Rákóczi rebellion (or the Turks in the 9YW). I’ll make a separate post about fodder. You are right that the reliance on German mercenaries can’t just be about German administration, since they raised those troops to fight elsewhere (and at the least the Maritime powers were paying for their supplies, if not their pay). Which takes us back to theaters. We still don’t know much about the role of contributions, e.g. the differing opinions of Lynn and Ferguson on their importance to the French. FWIW, I recall back right before I left Ohio State Geoffrey Parker was already conceding in class that early modern army growth was probably more a function of the increasing number of theaters, rather than the presence/absence of trace italienne fortifications. But you didn’t hear it from me. The problem is that despite many calls, there still is no robust dataset on early modern army sizes (in part for the reasons we’ve mentioned in previous posts) to make comparisons. Re: the mystery of small Po army sizes. I’ve since come across a few French sources who argued that there was no point in trying to gain an overwhelming numerical superiority over Eugene in Italy because the terrain (rivers and canals especially) so broke up the terrain that it was impossible to pursue and destroy an army after a battlefield defeat. Vauban described the crisscrossed terrain as a veritable fortress that a field army could shelter within. Sometimes the problem with logistics is too much information rather than too little. 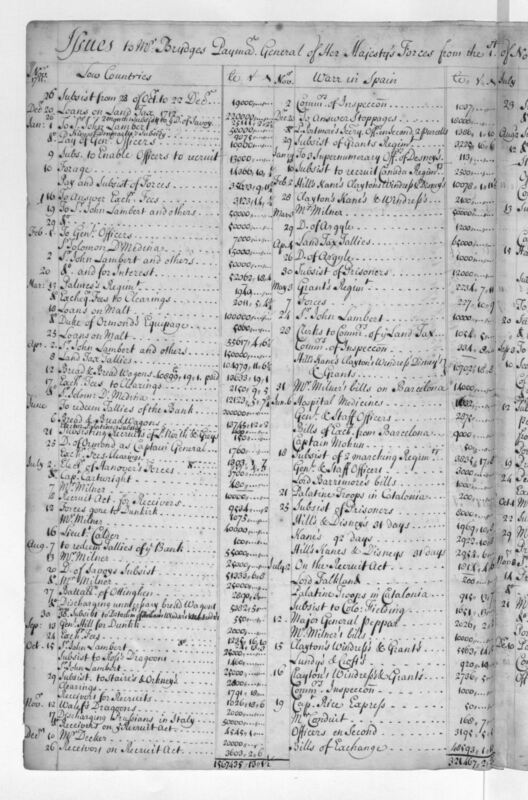 The PRO has a huge mountain of English Civil War financial and administrative records, especially in SP 28, but they’re hard to use because they’re not very well sorted or catalogued. Only a few of us know our way around them, and there are still lots of dark corners that haven’t been thoroughly investigated. One advantage of warrants and bills is that they were created as part of the process of logistics rather than an afterthought written for some other purpose. That doesn’t always make them perfectly reliable as there are some known cases of fraud, and probably some unknown ones too. Yep. I came across that in the brief stint I spent in the Archives nationales in Paris. Lots of pieces of paper with numbers on them, and very little sense of what they all meant. I’ll leave it to others to put them all together. Jean-Eric Iung did in part, but it’s a typescript thesis in a provincial French university archive that I haven’t had a chance to visit yet. Minor addition: in the 1690s English troops were allotted five pints of beer a day, i.e. 2.5 quarts or 2.3 liters (PRO SP 8/12 f14 from Jones, War and the Economy). Modern medicine says we need to drink at least 3 liters per day, and since these troops were undoubtedly more active than the average 20C Westerner, I’d guess they need to supplement that ration with other liquids (or more beer). I wonder how much of a boon war was to the brewmasters of Belgium? Very interesting discussion. I think the subject is such a vast one that we are only really at the stage of piecing together not only the mainsprings of military activity but also in considering how wider econonic and social factors impinged on logistics and supply. As others have pointed out, it often seems to be a problem of having too much primary material. I guess what I am trying to say is that until we know more of the minute detail we won’t be able to establish a pattern which can answer the bigger questions. Great discussion though. By the way, don’t forget naval supply. There is lots of interesting research going on at the NMM and University of Greenwich. Thanks for the comment. I have two posts describing the basic mechanism for cavalry supply in the hopper, but have been too busy with other things to finish them up quite yet. I’d argue that the economic/social factors have received far more attention than the reality of campaign logistics, whether it’s J.S. Wheeler on mid-17C England, the whole fiscal-military state debate started by John Brewer and D.W. Jones, Guy Rowlands’ new work coming out on French logistics in the Spanish Succession (as well as his Dynastic State), and now David Parrott’s new book on The Business of War (in addition to his earlier Richelieu’s Army). Darryl Dee’s Expansion and Crisis in Louis XIV’s France, as well as Gary McCollim’s Louis XIV’s Assault on Privilege: Nicolas Desmaretz and the Tax on Wealth focus on the French case just in the Spanish Succession. The Dutch have been going to town as well. Parker’s already talked a bit about finance in his Army of Flanders, and others like Gunn, Grummit and Cools, ‘t Hart, and Jan Glete’s War and the State have also discussed the matter. There are yet more works forthcoming, such as John Stapleton’s on the Dutch in the Nine Years War (which will look at campaign logistics in detail), and Aaron Graham on England c. 1680-c 1715. That doesn’t even include the broader studies of state fiscal policy and economics. And what do we have for campaign logistics? Perjés’s 1970 article on army provisioning. I agree, however, that we haven’t necessarily put it all together, although Parrott’s recent work is a start I think. Thank you for your informative and interesting reply. I’ve been out of the loop somewhat on this subject for a while (dipping my toes in the calmer waters of nineteenth-century political history) but your blogs have re-ignited my passiion for the subject. Now I remember all those sleepless nights thinking of forage procurement and bread wagons! I will certainly try and catch up on some of the recent literature, including hopefully your forthcoming work on the cavalry. I agree that State finance, mercantile activity, and economic structure have dominated in recent years, and that the actual campaigns have received somewhat short shrift. Nevertheless, a lot remains unknown, particularly in relation to sub-contractors, sutlers, and local authorities and elites. A few years ago I had the outline of an article on the military campaign in Scotland in 1746 but have yet to complete the research. I need to get into some of the local archives (rather than the NA or BL) to see what was happening on the campaign trail. I’m not sure if anyone has yet got to grips with the Jacobite Commissariat but that is an issue which had certainly been neglected. Well, thank again for the blog. Really great stuff. It’s an interesting piece on the provisions,etc. for the British and Hessians in America during the revolution. Although the location is on the wrong side of the pond, the allowances, etc. I believe are uniform across the service.